We loved the tastefully decorated interior of the lobby and the individual rooms was exceptionaly clean and well provided. We could not get over how quite our motel room was at night and the entire staff from the lobby checkin to the breakfast room employees were so friendly and helpful. We defintely will recommend to our friends and neighbors. Everything was spotless and the Continental breafast was outstanding and handled the many occupants extremely well. We did not experience any dislikes, everything was great! Pretty nice, but it was hard to find the front entrance at first. Proximity to Sea World and Disney. The wireless internet was ridiculously slow and the business center was pricey. Great location, security, clean and value. I would have preferred two queen beds over two full. The beautiful Fairfield Inn by Marriott Lake Buena Vista in The Marriott Village is an entirely smoke free hotel. Conveniently located near regional airports, local businesses and historic attractions, this Orlando, Florida hotel is the perfect place to stay while visiting the Magic Kingdom® Park, the world-famous Epcot® Cener, Disney's Animal Kingdom® Theme Park, Disney-MGM Studios, the Downtown Disney® Area, Disney's Blizzard Beach Water Park, Disney's Typhoon Lagoon Water Park, Pleasure Island, Disney Wide World of Sports, and SeaWorld® Orlando. Don't forget the Golf Clubs, this hotel is close enough to enjoy the Orlando World Center, and the Marriott-Hawk's Landing Golf Course. There are also plenty of other local recreation opportunities, like court sports, hiking and bicycle trails. Each of the spacious guest rooms at the Fairfield Inn by Marriott Lake Buena Vista in The Marriott Village feature microwave ovens and refrigerators, color television sets with several premium channels, coffee makers and complimentary coffee and tea, air conditioning with individual climate control for each room and luxury bedding. At the Fairfield Inn by Marriott Lake Buena Vista in The Marriott Village guests are spoiled with complimentary continental breakfast seven days a week. Be sure to take a break and refresh in our indoor swimming pool and whirlpool. Enjoy a work out in our complimentary on-site guest fitness center with all the latest cardiovascular equipment. Relax in the lobby with a complimentary cup of coffee or tea and enjoy complimentary high speed internet access throughout the hotel. If you're traveling with children you'll appreciate the fact that this hotel offers portable cribs. Visitors also enjoy complimentary toll free phone calls. 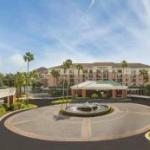 Previous guests at the Fairfield Inn by Marriott Lake Buena Vista in The Marriott Village have reported that the rooms were clean and the bedding comfortable. Guests enjoyed the complimentary breakfasts, and were pleasantly surprised to have so many options to choose from. Visitors reported easy check in and check out and found that the hotel staff were receptive to their needs for things like extra towels and extra blankets. Guests also enjoyed that this hotel was located so close to the local attractions. Most of the guests stated that if they were to visit the area again, they would enjoy a second visit to this hotel.